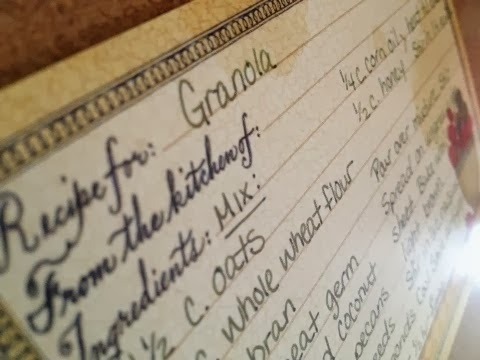 In my recipe card file sits one particular recipe that shows signs of lots of loving… is splattered and stained, showing signs of use time and again. (I’m sure I should have it memorized, but I still pull it out every time I make it.) 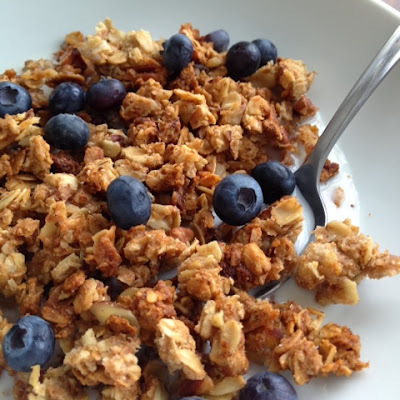 And that recipe is for a healthy, chunky, and absolutely delicious Granola. 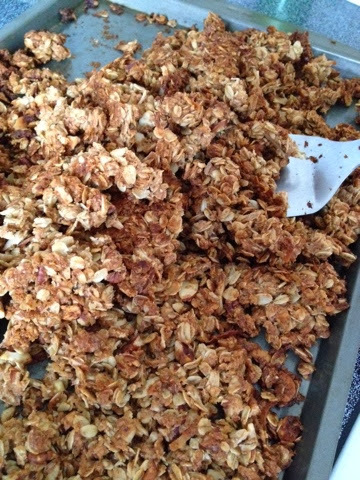 It’s the granola my mom would always make (and still does!) and I’ve never had another one like it. 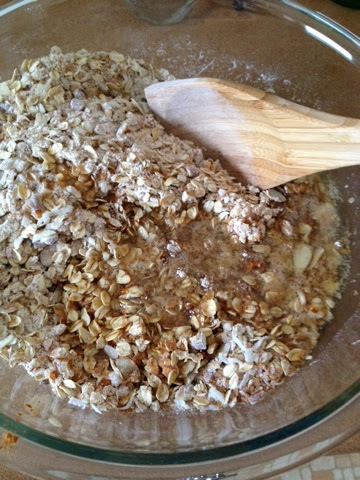 Combine all dry ingredients in a large bowl – oats, whole wheat flour, bran, wheat germ (I didn’t have any this time so I added a bit more bran and threw in a little ground flaxseed as well), flaked coconut, chopped pecans and slivered almonds. I find there’s quite a bit of flexibility… I throw in whatever I have on hand, make substitutions, omit things, etc. I’ve never had a batch turn out that I didn’t like! In a small saucepan, heat the oil and honey until bubbly. Remove it from the heat and add the vanilla. It’ll bubble and foam a little… fun stuff! 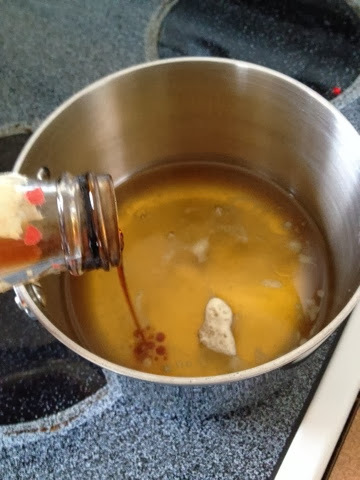 Pour the honey mixture over the dry ingredients and stir it until combined. 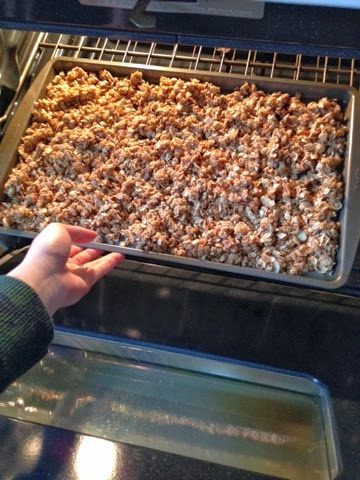 Spread evenly onto an ungreased baking sheet. Bake at 350° for about 30 minutes or until light brown. Halfway through the baking time, you can use a spatula to mix it (if you like smaller pieces). 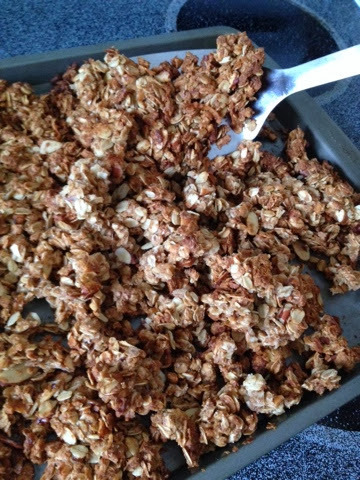 Or wait until it is baked through for chunkier granola. 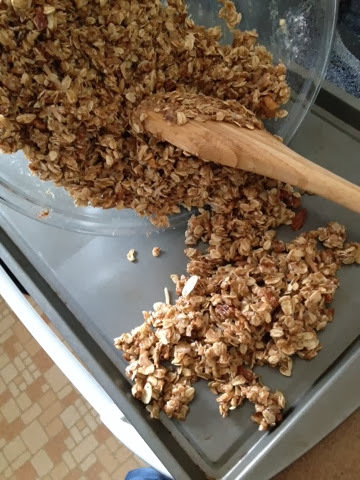 (You’ll definitely want to loosen the granola from the pan while it is still warm, otherwise it’ll stick to the pan as it cools.) Stir in some raisins, craisins, or cherries if you’d like. Allow it too cool completely and then (if any is left after nibbling at it!) store in an airtight container. 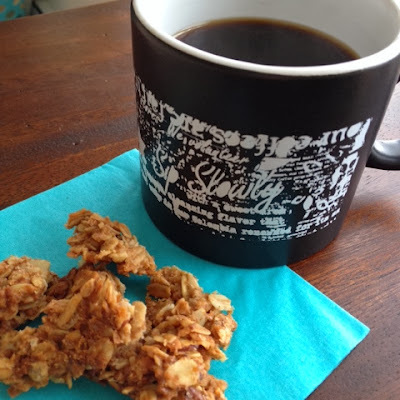 Or (my personal preference) enjoy with a cup of coffee for breakfast, a snack, or dessert! Here’s the recipe. Oh, and do yourself a favor… double it! Pour the contents of the saucepan over the dry mixture and stir together. Add raisins or craisins if you’d like. Cool; then store in an airtight container. 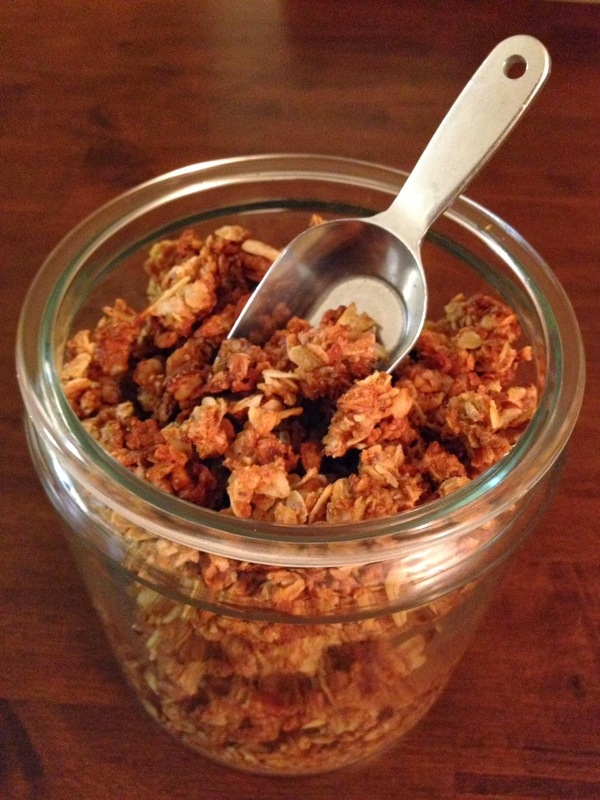 Enjoy with milk, yogurt, or plain as a snack! This looks delicious! 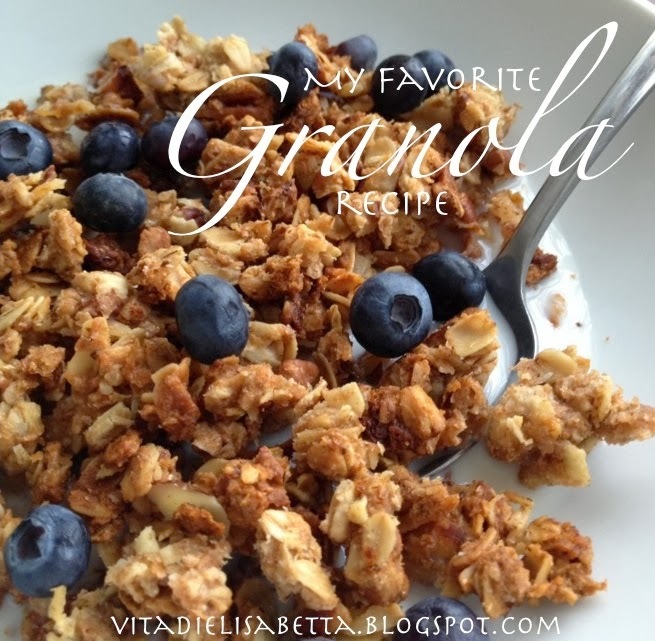 I always just sort of make up a granola recipe every time I make it….but maybe more consistency is good! 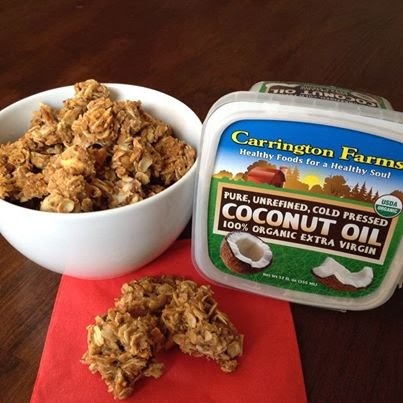 I never get mine as chunky as I like- I think I will give this recipe a try- thanks Biz! You’re brave to make it up as you go!! You’ll have to let me know if you find any additions/changes you experiment with. This looks delicious biz! 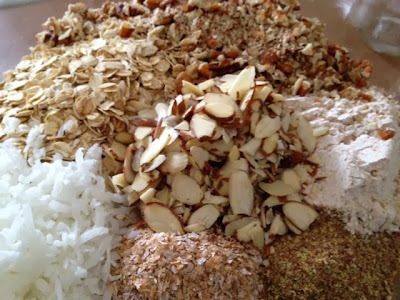 I always wanted a healthy recipe for granola! Just one question, what kind of oil did you use? The regular vegetable for baking or can olive would work? What’s your suggestion?